Zero or more nodes can be added to a hashtable bucket. They are organized as a doubly linked list through prev and next pointers. Definition at line 61 of file name-tree-hashtable.hpp. Definition at line 92 of file name-tree-hashtable.cpp. Definition at line 100 of file name-tree-hashtable.cpp. Definition at line 75 of file name-tree-hashtable.hpp. Referenced by nfd::name_tree::FullEnumerationImpl::advance(), and nfd::name_tree::Hashtable::erase(). Definition at line 76 of file name-tree-hashtable.hpp. Referenced by nfd::name_tree::Hashtable::~Hashtable(), and ~Node(). Definition at line 77 of file name-tree-hashtable.hpp. 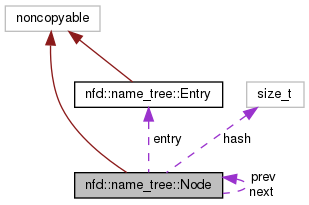 Referenced by nfd::name_tree::FullEnumerationImpl::advance(), nfd::name_tree::Hashtable::~Hashtable(), and ~Node(). Definition at line 78 of file name-tree-hashtable.hpp. Referenced by nfd::name_tree::FullEnumerationImpl::advance(), nfd::name_tree::Hashtable::erase(), nfd::name_tree::NameTree::findExactMatch(), nfd::name_tree::NameTree::findLongestPrefixMatch(), and nfd::name_tree::NameTree::lookup().